When it comes to convention, people tend to drift towards familiarity. They become comfortable with an idea, a routine, a way of being, a way of behaving. And when someone offers up the idea that would jeopardize the routine, the known, the traditional structure, many people are nervous to submit to the idea in favor for what is known. Because usually, the reason an idea or way of being is known is because it has worked so the logic therefore would prove that it must be right. Now, applying that philosophy to learning, it’s easy to see why many would argue the value in in-class learning. The teachers are all there to hold attention spans, to immediately answers questions that come up while the material is being taught. There is also this sort of command that takes place when an instructor is physically present in a room as opposed to cyberspace, where social media and hours of lethargy, a.k.a. Netflix, is only a click away. Be that as it might, there are still several great aspects to online learning which traditional, in-class learning don’t necessarily afford. Along with that comes the ability to fast forward. There has been a point in every student’s career where the teacher started a new concept and though you may have picked up on it quickly, the rest of the class still needed to go through the explanations and various examples before the concepts had been cemented. This resulted in teaching to the general public as opposed to each individuals needs. With online classes, each experience and lesson timing would be different by individual basis; some may fly through the video on kinematics whereas others might need to go through, rewind, and replay the video a few times before the ideas cement. Online courses would also provide a much less stressful time when it comes to registration. Because certain classes are only offered at specific times, every student will come to a point in his/her career with registration where they must decide between two classes because both are being offered during the same block. With online learning, every semester can become the dream schedule set up on courseoff. Online classes would provide new problems to deal with. One of which is the idea of interaction. Though online chatrooms are viable, they aren’t the same as personal interactions. I would still find it crucial to incorporate interactions between students into the curriculum to practice real world skills and applying materials learned from the course. I think the key to online courses is being prepared to handle the work load. The killer for online courses is students gaining a sort of complex that makes them think they can shove nine lectures-worth of material in the night before a test. It wouldn’t matter if the course was in-class or online at that point, the results will be the same that the sudent won’t do as well as they would have had they been better prepared. Just because online courses give the student flexibility with their schedules, ultimately they still have to manage their time effectively if they want to be successful. With the dawn of modern technology and its rapidly evolving state, it’s not surprising that classroom learning is starting to look like a thing of the past. This appearance is in fact very misleading. Despite these advances in technology and the vast amount of online resources now available in most subjects to today’s students, in class learning still has great value. Let’s face it, not everyone learns the same way; and not every type of class can be effectively taught in the same manner. By having physical lectures for people to attend, professors afford students the opportunity to ask questions in person and have an in depth discussion in a manner that can be extremely difficult to maintain in an online setting. Students are able to hear the professor clarify complex concepts and even have the opportunity to debate with their peers in a structured classroom setting. This additional interaction can help solidify students’ comprehension of a topic. On top of that, professors are able to improvise their teaching method immediately if necessary and provide further examples and clarifications off the top of their head instead of only being able to provide what they can think of in advance. 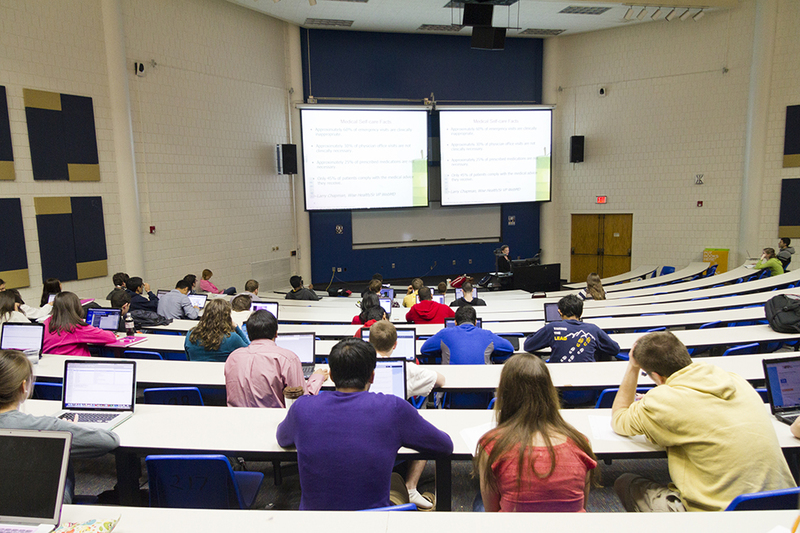 In this respect, professors are able to both anticipate the needs of students but also adapt when needed—something that doesn’t really happen when lectures are simply posted for students to view. Also, professors and TAs hold office hours, which tends to make learning material easier for students because they can come in and ask questions in person with a lot less people around—a difficult thing to do when the class is entirely online. In this way, students get a more well-rounded learning experience that just isn’t possible to achieve through online learning. In fact, online learning also cannot truly offer replacements for group projects and in-person presentations, which—much as students may hate them—are extremely important to life after college. The ability to work within a team and to articulate thoughts aloud in front of a group is important not just on the job, but also in getting the job to begin with. Teamwork skills are extremely important when applying for jobs because getting hired to do a job that requires absolutely no human interaction just isn’t a feasible plan. Employers want people who are capable of working in a dynamic team, not someone who doesn’t know how to play well with others. Try as it might, online learning just can’t compensate for this crucial part of education. One other extremely important bi-product of in-class learning is just not possible to achieve in the same manner as in online learning: letters of recommendation. While letters of recommendation can still be obtained through online learning, a professor will be unable to produce the same caliber of recommendation because they have never really had face-to-face contact with the student the letter is for. Strong letters of recommendation rely on how well a professor can articulate his/her observations of a person’s skills, personality and work ethic—something heavily reliant on actually being able to witness these skills in action. While there are many programs online that teach certain subjects very effectively, not everything can be taught through a computer screen.